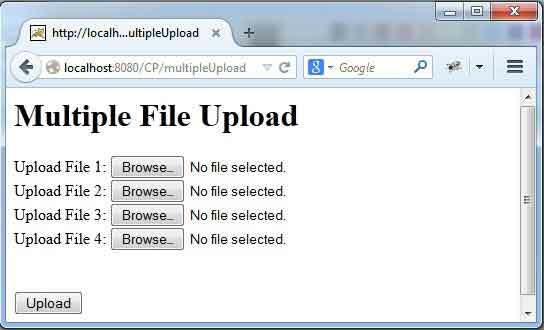 On this page we will learn how to upload a file in Spring 4 MVC. We are presenting the demo for single and multiple file upload. We are using XML less configurations. MultipartConfigElement Bean needs to be configured for file upload. In controller, method argument should be MultipartFile class for uploading the file. The JSP form, enctype must be set for multipart form data. Check the demo now. To run the file upload demo in Spring 4, get ready with below software. 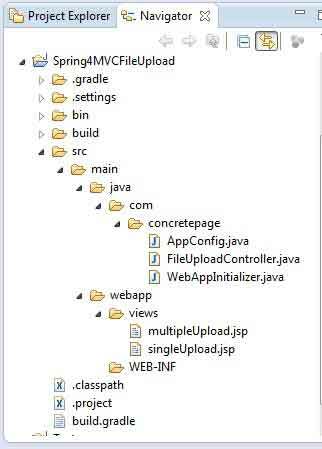 For better understanding, get the file location in eclipse how to put our classes and JSPs. 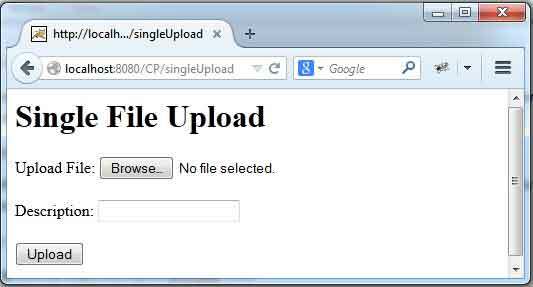 In our example we are presenting demo for single and multiple file upload. So we have created two different methods for uploading the file. In single upload, the method should have the parameter as below with other parameters. Get the name of file from MultipartFile object and save it to your desired location. Find the controller. In the configuration class, we need to use bean for MultipartConfigElement and UrlBasedViewResolver. MultipartConfigElement supports the file upload where we can set max file size, max request size etc. MultipartConfigElement needs to be configured with Dispatcher servlet using WebApplicationInitializer . UrlBasedViewResolver defines the JSP location and file extension pattern of output. WebApplicationInitializer is used when our application is not using web.xml. This supports all functionality which web.xml does. To supports file upload our dispatcher must be set for multipart config. View: Use of enctype="multipart/form-data" and type="file"
The JSPs are being used as views. To support file upload, form must be set with enctype for multipart form data and there should a file input text. We have two JSP. Find the JSP for single file upload. Find the JSP for multiple file Upload. We need to take care that each input type of file type must have same name, so that it could be accessed as an array. Find the gradle script for JAR dependency and creating WAR file of the project. Spring boot web and security are being used. Find the steps to run the demo project. 1. Download source code and navigate to root directory of the project using command prompt. 2. Run command "gradle clean build". Make sure you have already installed Gradle build tool. 3. A WAR file will be created in "build/libs" directory. 4. Deploy WAR in tomcat. In our demo we are using tomcat 7.